Ah, yes, the electrolyte issue again! After I got back from the race weekend in NJ, complete with ER trip, I had repeat bloodwork done at my primary care physician's office. And, wouldn't you know, my potassium levels are borderline low. I took this weekend off from racing and have been training closer to home while I do a trial of K-dur (a prescription potassium suppliment usually given to older people with heart issues who are on diuretics!). This is interesting because taking a daily potassium suppliment could be very dangerous, if I were to alter (lower) my training/racing plan. Potassium has a very narrow normal range, and then it can cause lethal heart problems including sudden death. I am currently starting on a fairly low-moderate dose, once a day, and will be completing another set of bloodwork before going to race out of town next weekend. Figuring out my dosage with my physician was an interesting conversation, involving laying out exactly how many hours per week I am training/racing at a high enough intensity to drive down my potassium levels. Yes, exercise does naturally drive potassium down. Your cells need it to function properly in an aerobic state. And, chronic diarhea also lowers your potassium. Having a high output ostomy and high intensity training/racing for 8-12 hours per week is enough to really knock out some potassium. How has it been going so far? Well, it took a few days for my body to readjust after getting screwed up last weekend. But, at the end of 5 consecutive training days, I'd say it's going pretty well. I did some team time trial practice with another teammate who didn't race this weekend, and got well into that satisfying place of feeling the hurt! A photo of me lined up with the most interesting time trial team ever. Notice where I line up to the shoulders of the two guys on either side of me? Oh, Crohn's, why did you have to stunt my growth so terribly? There is almost a full foot height difference there. Team Time Trial: 14th out of 15 teams with less than a two minute gap between the first and last teams. Sadly, after the race, the hard part of my day wasn't over yet! At first it started out as just a nagging headache. And, I didn't help it much by standing around in the sun cheering for team mates. Then, bam! raging headache and feeling like I'm going to hurl! And, let the vomitting begin! I forcefully vomitted for hours on end, so hard that I pulled an ab muscle above my ostomy site and could hardly breath between heaving. It was horrible. My kind and patient teammate drove me to an ER and sat in the waiting room with me. By that point I was feeling dizzy, with cold tingly hands. And, then I sat in the waiting area some more... until I started having palpitations. But, because I was still vomitting so hard I could hardly speak. Pointing at your chest in an ER waiting room is suprisingly ineffective. Once I was able to communicate that I was having palpitations, they took me back to the ER immediately and started me on saline IVs, and zofran for the vomitting. When labs came back, my potassium was low, yet again. So, it seems that I haven't solved my electrolyte issue after all! Sigh. It was 10pm by the time I got out of the ER, leaving a 6+ hour gap from the time of my races to the time when I was able to eat and keep food down. My legs were already cramping and feeling deflated by that point. It was a horrible lesson in what happens if you race and then deprive your body of the nutrients it needs to refeul and recover afterwards. Criterium (short flat circuit): Yes, I did race in the criterium on Sunday! Even after a night of vomitting and low potassium, I made it to the starting line! I can't say I did much else. I was pulled an placed midway through the race, after 6 laps according to my coach. Honestly, I was in so much agony that I didn't know what lap it was. I felt like somebody had beaten me all over my body with a crowbar. And, like I was going to vomit again - residual naussea, anyone? I was both sad to be pulled and relieved to stop. Everyone said I looked like hell. But, then, I've been doing a lot of that at races this year. For some reason I am strong on training rides but consistantly underperform on race days. Yet, I'm having the time of my life and learning a ton! Even if I take DFL again next week, it will still be a fun time! But, I'm hoping for better. Today I went against my training plan... and rode 60 miles on what was supposed to be an off day. I couldn't help it! It was so sunny out! It was the last day of spring break! And yes, I confess that this was a premeditated crime against the training plan. And, it was soooo sooo good. Even after 3,000+ feet of climbing, my legs aren't toast and my ankle is feeling fine. Here's looking forward to TTT (team time trial) practice this week, in preparation for races in Philly next weekend! On a deeper note, I keep on thinking that I should tell at least some of my teammates what is up - that I have an ileostomy. Clearly, some if not all of them have noticed that I wear an extra piece of clothing and am funny about what I eat. I feel like it would be helpful if everyone was on the same page. But, I'm not quite sure how to go about filling them in without making a little public service announcement at a team meeting. Telling everyone individually seems overly energy intensive. So far, our coach is the only one who knows what's up. If you do any reading or talking about bicycling, you've probably heard people say over and over again how important a good pre-ride meal and hydration routine is. Yet, with IBD or an ileostomy, it is all too easy to cut one's self short. Eating leads to an active gut, and that's the last thing anyone with IBD or an ostomy wants on a bicycle. I like to not have to think about my guts when I'm trying to get my daily miles in, or set a new personal best up that climb that haunts my dreams/nightmares. I used to be afraid of eating much before going out to ride. And, that meant that (especially if I was starting early, 7 am anyone?) I'd be running on just a piece of toast and peanut butter plus some gatorade as I headed out the door. And yes, I've done centuries more than a few times on this routine. But, midride I start feeling like I just can't keep up, and later that afternoon I end up feeling like somebody beat me with a baseball bat - regardless of how much post-ride feuling I did. Worst is the next day, if I'm riding again, when I felt like my legs just didn't want to work no matter how hard I willed them to. But, I've reformed my ways. These days I know that if I'm heading into 3 consecutive days of interval training, and preparing for the next race weekend, I have to always be thinking about the future - not just the ride today. I know that if I run myself down to empty on the first day of training, because I didn't eat appropriately, I will blow any chance of being productive on the next two days. I started eating oatmeal and some juice before rides later this past summer, and carrying a few GU shots with me, and thought I was doing pretty well. To prepare for a race effort (or long, high intensity training), (according to my coach) an athlete should be eating ~2 grams of carbohydrates/kg, 3-4 hours prior!!! Or, ~1.5g/kg 2 hours prior. Plus enough protien to keep you running efficiently. And, don't forget the water! The closer to the effort you get, the less carbs and calories you should be loading. You also need to give yourself time to hydrate (and pee) prior to hitting the bike, so you don't head out with a sloshy stomach and the desire to hurl on the first hill. I found that when I did the math, I was still selling myself short. Oatmeal with honey and PB was still only ~50g of carbs. I weight 58.5 kg (divide lbs by 2.2). This means that I need to be loading 87.75 grams of carbs 2 hours prior to racing or high intesity training. This is equal to: 1 bagel (the real kind, not the ones that are just circular bread!) with peanut butter and honey, 8 oz of OJ, 8 oz yogurt, 1 bannana. Or, today's breakfast: a stack of sweet potato pancakes with maple syrup, a large bowl of nonfat yogurt with a sprinkling of cocoa crispies cereal, and a coffee. For a hilly 3 hour ride, I will be bringing 4 GU shots, each equal to 100 calories. This past weekend was the ECCC ("E tri-C") season opener! The Pitt team caravan got home close to midnight last night, so I'm feeling a bit tired and achey. But, it was a blast! Our team did well overall, with a few guys in upper categories (A & B) making massive breaks off of the front of the peleton. The break in A was a 45 second gap for half of an hour long criterium, with three points Primes (sprint laps with points awarded)picked up. The breaks in B were in both the road and crit, with close to a full minute gap on the pack and overall top ten placements in both rides. In women's our team got 6th place time trial and 7th place womens A/B crit places. MIT cleaned house in the road and crits in men and womens, with a number of pro team members in the race (the men's A road winner is a Garmin development team member). Sadly, we had one teamate crash in the D category, and one get caught in a major pileup in the C road race. They are both ok, but sore. I went into this weekend not fully expecting to finish either the road or criterium, having only ridden a few times since spraining my ankle. And, I did pull myself from both the road and crit because my ankle was hurting in a bad way. It wouldn't be worth throwing away a whole season on the first weekend. I did start in C category (the categories are A, B, C, D, and Intro) despite this being my first season racing with a team. And, after some initial intimidation and aprehension, it felt like a good place to be! What I will say is that the collegiate categories are overall more way aggressive than the local categories. The guys are fit, fast, and not afraid of bumping in the pack. There was significant overlap in the time trial results for the A,B and C men's categories, and the C men's road and crit races were FAST! As the announcer said, "C men's: kinda fast, kinda dangerous". As opposed to B mens which is fast, and A men's which is blazingly fast and more stategic as a race. Prior to pulling myself in the road race, I learned lessons about not getting boxed in on a narrow road, about strategic placement on corners (don't get squeezed out to the curb!) and about when it is appropriate to start yelling at people. 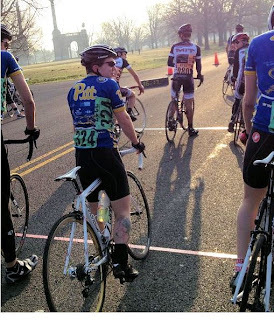 My teamates said I should have yelled more when two Penn State races tried to push me over the yellow line on a steady ascent (automatic disqualification for crossing the yellow line). But, it was also the first time i got to do some elbowing back in a road race. Three times! I've never honestly elbowed somebody with the intent of pushing them over before! It was a good learning experience. I still couldnt get out of the middle of the pack and move up until I was at the point where my ankle was twinging and I let myself drift out the back. luckily, I pulled myself just before the entire back of the pack wrecked. It looked like a landmine went off under the pack! Bodies and bikes flying through the air. A few major injuries with loss of conciousness resulted. I was feeling more confident, despite starting with a bad right ankle and a mechanical issue with my left cleat (couldn't get muddy crud out of my finicky Speedplay cleat, despite lots of banging and resorting to putting it under a sink. 1 minute prior to staging, as my coach was holding me up on the bike while I was trying and failing to force it to click - which would have forced me to start on the wrong leg- he said "you're going to have to do a Lance on this one... don't push it too far if the stress is too much on your bad ankle". I was consistantly able to move up towards the front of the pack on the 1/4 mile climb (atypical crit course! ), and realized that I'm a much more aggressive descender than most others in C. But, doing most of the work with my right leg because my left was unclipped was too much stress on my ankle. One lap under half way through, I let myself fall off the pack on the climb. If I hadn't had to take myself out of the race, I might have stuck with the front group for the crit and gotten a top 20 finish. It was a confidence booster, but also a good lesson in what I have to work on before the next race! 1. Finding my most efficient climbing gears for a race pace. 2. And, I desperately need to improve my nutritional status and get more sleep on a regular basis. I was definately feeling the effects of anemia from recently diagnosed iron deficiency - it feels kind of like drowning and desperately trying to stay afloat on hard efforts. Not a fun feeling. And, the nagging cough I've had since strep throat came around my office a couple of weeks ago. I've always found that I got sick more often and more intensely than my non-autoimmune disease friends. This is yet another example of how much harder it can be to recover from illness when you are starting with any other nutritional deficits, or on immune suppresant medications (which, for the moment, I am not). I can't wait for the race in a couple of weeks! Hopefully my ankle will behave better and I'll be back with a vengance as the only gutless cyclist in the ECCC, and maybe all of collegiate cycling history!